Bigger isn’t always better. But sometimes it is. Sometimes when you take a good thing and make it bigger, you get…well more. More utility, more versatility, more value. That’s the case with the PrismJET VJ64, the newest addition to the PrismJET printer line. Our best-selling PrismJET VJ54 is an outstanding value. But for some customers need something a little bigger. Wider actually. So, we took the next step, talked with our partners and added a 64” variant with all the benefits of a wider chassis. You can print wider prints, take bigger orders. And in keeping with the PrismJET legacy of exceptional value, we gave it an unbeatable price. Welcome to Wide. For those unfamiliar, PrismJET is a hybrid product based on MUTOH technology and available only through SIGNWarehouse. We can offer these unique products because we sell more MUTOH printers than anyone in America. So, with the PrismJET brand, you get established quality, great value and excellent support. Quality: The most important thing about the PrismJET VJ64 isn’t the price or the size, it’s the quality. The heart of the printer is its advanced piezo print head configured for optimal print quality. Other printers have joined the max output arms race and made sacrifices for top speed. Some of those sacrifices affect print quality. The piezo head in the PrismJET VJ64 uses smaller nozzles that produce more satisfying high-resolution prints. The maximum resolution is 1440 x 1440 dpi. But it’s not just the number. Owners who use these heads report that the images are crisper and sharper than prints from comparable printers. It’s not the fastest 64” printer we offer, but if quality if your priority, this is the one for you. Technology: Part of that quality comes from the patented wave print firmware that virtually eliminates banding and makes color management easier. 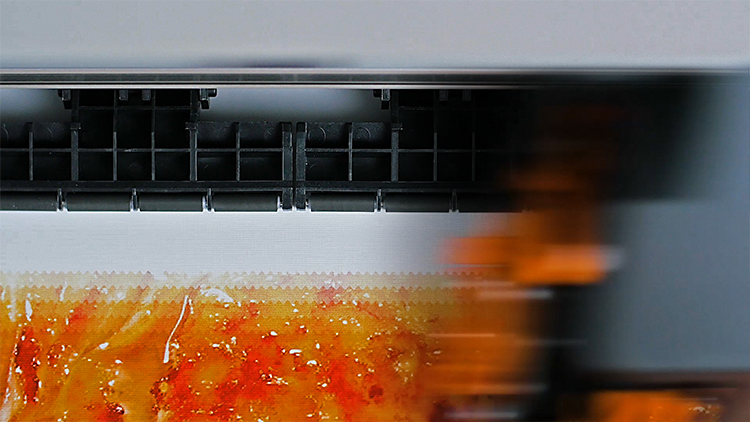 Instead of laying down ink in straight, horizontal overlapping passes like conventional inkjet printers, the piezo head in the VJ64 uses overlapping wave patterns that allow it to lay down ink more quickly with fewer passes with virtually no visible banding (Fig 1). It’s a great blend of quality and productivity. Fig 1: Wave printing lays down ink in overlapping waves that eliminate banding. Simplicity: Because of the advanced wave print firmware, the VJ64 can produce commercial grade output with only one print head. This means you don’t have to worry about realigning multiple heads to preserve print quality. Single-head printers are also easier and more economical to maintain in the long run. Wider: Being a wide format printer means having to handle wide format media. The VJ64 uses a different media handling system than the VJ54. 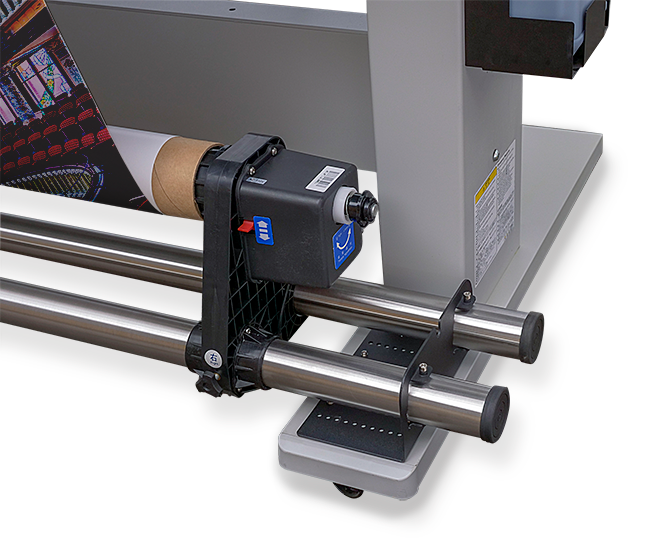 Media loading is made easier by the use of adjustable scroll brackets that can be quickly and easily inserted into the media core and adjusted for all sizes of rolls up to 64 inches. That’s the overview. Let’s bore into some of the other features that make the PrismJET VJ64 such a great value. Automated media take-up. Wider printers use larger rolls of media. That requires more robust media handling. We mentioned the easy media loading system. That makes it easier to load media on the back of the printer. To make it easier to manage what comes off the front, we offer an automated media take-up that winds prints onto a tensioned scroller bar system. This makes production of wide format printing easier to manage. Keep your prints clean and pristine (Fig 2). Fig 2: The automated media take-up system uses two motors and scroller bars to keep your prints clean and easy to manage. EnduraINK PRO: We talked about the wave print firmware and its production of high-resolution prints. The head is only as good as the ink that runs through it. The PrismJET VJ64 is powered by EnduraINK PRO eco-solvent ink. EnduraINK PRO is an environmentally friendly solvent-based ink that strikes a perfect balance between rugged performance, durability and sustainability. It’s rated for up to three years outdoors without lamination, so your prints will look great for years to come. The ink has great abrasion resistance so standard applications like banners and storefront decals can be sold as is. For applications that involve washing and frequent handling, lamination is recommended. EnduraINK PRO ink is made in the USA and carries an impressive array of environmentally friendly credentials. It’s CPSIA compliant and meets California’s demanding PROP 65 consumer safety standard. It’s GBL free and meets Europe’s EN71/3 “Safety for Toys” certification. You can rest assured that you’re not saving money at the expense of your customer’s or employees health and well-being. But you will no doubt save money because EnduraINK PRO ink costs on average about 20% than comparable OEM ink. Go Bigger: If you’re going to make the move to a wider printer, for more economical print production, it makes sense to consider the EnduraINK PRO high capacity ink option. We now offer EnduraINK Por ink in one-liter bags for the optional high capacity ink adapter kit. This allows you to replace the standard issue 220ml cartridges with a much larger capacity system that reduces the frequency of cartridge replacements and lowers print cost even more (Fig 3). The double-discount of using EnduraINK Pro ink in the high capacity adapter lowers your average print cost by 33% *. Of course, ink cost depends on usage and image saturation. Your mileage may vary. Fig 3: Moving up to 1,000ml Ink Bags will drive down your printing costs. What do you do with a 64” eco-solvent printer? Just about anything. Combining an outdoor-durable eco-solvent ink with the capabilities of an advanced piezo print head gives you a wide gamut of compatible applications. 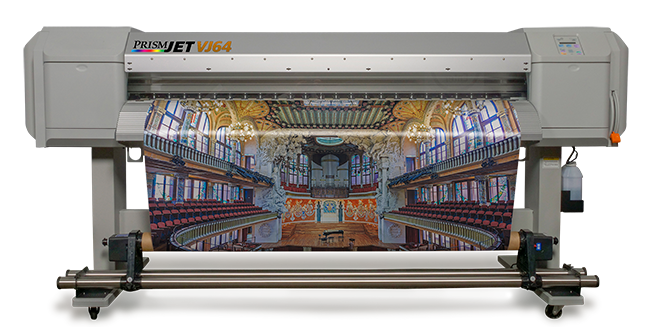 The PrismJET VJ64 accepts coated and un-coated roll media from 25 to 64 inches wide. We are continually surprised at some of the ingenious things our customers do with their printers. Time would fail to list all the compatible profitable applications, but here are the most common. We like to make deciding on a printer purchase a little easier, so we offer the VJ64 in several packages ready-made for common applications. Banner Bundle: Banners are big business, so of course we offer a VJ64 banner bundle. The VJ64 easily accommodates banner widths over 62”. The VJ64 banner bundle starts at $12,995.00. Print & Cut Package: If contour-cut vinyl decals are you bread & butter, check out the 64” print & cut package. It comes with our top-of-the-line Vinyl Express Q64 vinyl cutter and LXI RIP12 software. You can run both the printer and cutter simultaneously for double the productivity of an integrated print & cut machine. At only $15,995.00, it’s an unbeatable value. Bulk Ink Bundle: Speaking of value, for those who are relentless about driving down printing costs, we offer the bulk ink bundle with high capacity, and a set of 1,000ml bags of EnduraInk Pro ink. Starts at $11,695.00. Budget Starter Bundle If you just want the bare bones economy starter bundle with VJ64, LXI RIP 12, EIP and starter media, you can go wide at an everyday low price of just $9,995.00 plus shipping. Yes, you read that right. We offer a 64” eco-solvent printer with patented wave print technology under 10 grand. As noted above, the PrismJET VJ64 is the most affordable eco-solvent printer in its class. If you’re not sure which phttps://www.signwarehouse.com/p/prismjet-vj-64-large-format-color-printerackage is right for you, feel free to click here for more information, including specifications. Or request a print sample and a custom quote based on your individual needs and applications. The PrismJET VJ64 is the latest offering from a brand has been around for over 20 years now. It’s available exclusively from SIGNWarehouse. So of course, it’s an exceptional value. You get advanced engineering, high resolution printing, simplicity, reliability and economy. And now you get all of that in a 64-inch-wide eco-solvent printer that maximizes opportunity while minimizing cost. You’re welcome.